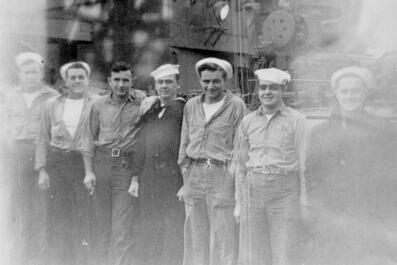 I am the son of a Guest crewman: Lloyd E. DeBolt Jr., Torpedoman second class. I live with Mom and Dad and take care of them now. Dad is 77, and partially paralyzed from a stroke. Dad joined the Guest at New Caledonia I believe, about June of 1943. I will send a photo of him separately. He served on it until the end of the war. Dad shared a lot of stories with me as I was growing up, but it wasn't until very recently that I heard the whole story (or more of it), of the kamikaze attack off Okinawa in May 1945. 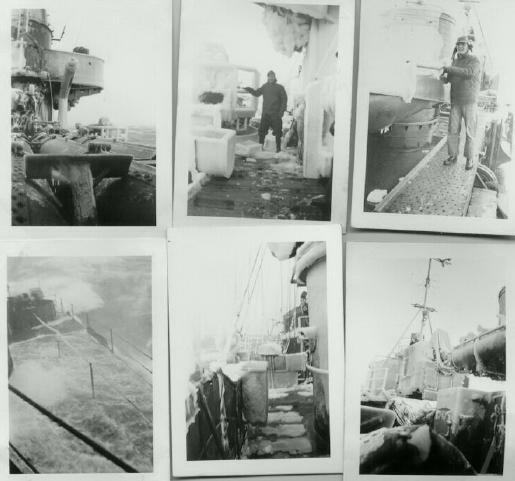 Dad was going to be killed by the crash, when the plane pulled up and sailed over the ship. He still has a piece of the wing that tore off against the radar mast and landed on the ship. Dad married (Alice) Elaine Crosby in Fort Wayne on 8 June 1946. I am the youngest of of their four children. Since the stroke I take care of Mom and Dad. I am 42. Photo of Dad, taken in 1943. Very glad to see this site. I will scan you some small photos he has around of an ice-covered Guest, somewhere in the North Pacific. Dad kept a little log book of where he went with the ship. If I run across it (it's stored somewhere), I will send you the info from it, altho I am sure you have all that data. This passed to my Guest email list upon receipt. Subject: My father TMC 3 Loyd E. (Bud) DeBolt Jr.
Hello, My name is Edward L. DeBolt. 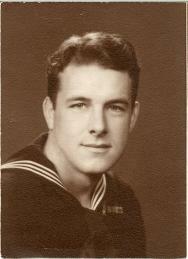 I am the oldest son of Lloyd E. (Bud) DeBolt Jr. who served as a torpedoman aboard the USS Guest during World War Two. I am writing to you to tell you of the passing of my father. He passed away at approximately 6:40 PM Indiana time on Sunday September 2nd, 2001. Dads was almost 78 years old, His 78th birthday will be on October 25th. He was a tremendous father, and taught me so much. He taught me the value of hard work, good values and morals, and always treat other people good. It is because of him, and men like you, and all of those brave and valiant men who served aboard DD472 that we have the wonderful freedom we enjoy today. Dad told me once of the Japanese Kamikaze attack during the battle of Okinawa, in April of 1945 as he was helping to pass ammuniation to a gun postion during the attack, and how close the kamikaze plane came to scoring a direct hit on the USS Guest. He suffered a stroke three years ago and had an MRI induced flashback to this event, of which almost killed him in his poor physical state at the time, and I had to really climb all over the doctors about it, as they simply couldn't understand what happened to him. Anyway I wanted you and his shipmates to know of his passing. He succumbed as the result of a second major stroke about six weeks ago (July 25th). He was comfortable, and died peacefully in his sleep. Perhaps you could have a special honor of some sorts for my father at your reunion. PS... By the way, Dad was a Jr. His dad, (Sr.), was also a navy vet, 1914-1919. Grandpa sereved aboard the USS Pennsylvania, and is also buried at Huntertown, near where he grew up and dad played as a boy. #1. 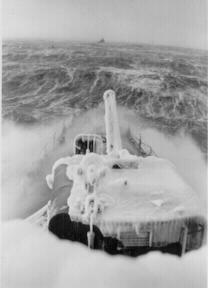 Ice storm, Aluetian Islands. #2. Taken from back of photo:Dixon, DeBolt, Muncrief, Smith, Heinrich, Madeira, Kelly. #3. No Info. Can anyone give me name? Many Thanks to Edward DeBolt for these photos. Click on any line to return to that page.